Prime Minister Tony Blair's Labor party was braced for setbacks in local elections Thursday where many voters were expected to cast their ballots in protest of his support for the war in Iraq. Blair's personal popularity has tumbled since the war began last year. Voters question his judgment and honesty. A leader of an opposition party says people are "dismayed" by Britain's role in the war, and by confusion and lack of planning in its aftermath. British voters are electing many of the local councils that run towns, the municipal government of London and their representatives to the European Parliament — the legislative body of the European Union. 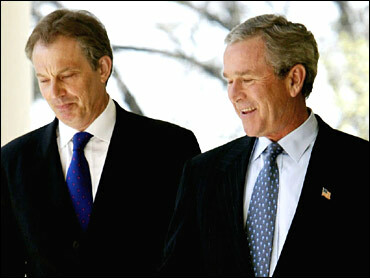 Opponents are urging voters to use the elections to punish Blair's government for joining the U.S. coalition. Thursday's vote sets the stage for national elections expected next year, in which it is still unclear if Blair will lead the Labor Party or step aside. The Guardian reports that Labor party leaders fear they may place a dismal third when all the votes are tallied, behind not only their traditional rivals in the Conservative party but also the Liberal Democrats. "I want to give Labor a bloody nose because of the war," said Steve Lee, 53, an electrician voting in north London. "As a lifelong Labor member, I think he (Blair) has gone completely mad." Lee was backing the Respect coalition recently formed by George Galloway, who was kicked out of the Labor Party for his vehement opposition to the war. Blair is currently in the United States for the Group of Eight summit, and plans to attend Friday's funeral for former President Reagan in Washington. He has endured a series of crises since the push toward war began in 2002, from stiff opposition within his own party on votes authorizing the war, to the dispute about pre-war intelligence, a row with the BBC over claims his government "sexed-up" a key WMD claim, the suicide of a government scientist involved in the BBC report, and the prisoner abuse scandal. At several points in the past 18 months, Blair's ability to survive has been in doubt. In his book about the Bush administration's approach to the war, author Bob Woodward said President Bush was so afraid Blair's government would collapse that he offered to let Blair back out of a commitment to send British troops to Iraq. Blair refused. The prime minister's travails over the war hastened speculation about his future. Having guided Labor to two stunning victories, it has always been unclear whether Blair would lead the party through the next elections, which are due by the summer of 2006. Iraq has also exposed Blair's uneasy relationship with his party's left wing, which has always accepted the centrist Blair only begrudgingly. Besides Iraq, Britain's role in Europe is also a major issue in the elections to the European Parliament. The U.K. Independence Party, which advocates immediate British withdrawal from the EU, has been embraced by a large and enthusiastic British Euro-skeptic constituency and is expected to be a big winner. TV personality Robert Kilroy-Silk — sacked by the British Broadcasting Corp. for offensive comments about Arabs — has boosted the party's profile by running on its ticket. Elections for the European Parliament are occurring across Europe. The voting began Thursday in Britain and the Netherlands. Ireland and the Czech Republic were to vote Friday, but most of the 25 nations were waiting until Sunday. In Spain, the new Socialist Prime Minister Jose Luis Rodriguez Zapatero is looking for a boost after quickly fulfilling his electoral promise to withdraw Spanish troops from Iraq. The European Parliament, based in both Strasbourg, France, and Brussels, Belgium, was created to provide a democratic balance to the EU's unelected commission. It has steadily gained legislative powers since the first elections in 1979, and now has EU budget approval and influence over EU legislation on trade, environment and consumer affairs. Although no single issue has dominated the campaign EU-wide, efforts to negotiate a constitution for the union have been a major issue for parties that see the charter as a threat to national sovereignty and a stepping stone to a European super-state. The elections are the first for the parliament since the European Union expanded May 1 by adding 10 new members and expanding its population to 450 million. Some 14,670 candidates in 25 nations were running for 732 seats.